On Saturday, September 9, 2014, two High School VEX robotics teams attended McKinley Vexposition at McKinley High School. Headed by Captain Kristen Tumacder, they had one robot that they had been working on since the end of May, 2014 which was dependable and a second that was a new design. The drivers, Cameron Pires, Hudson Jones, and Jenna Tanna were comfortable with its maneuverability. The drivers prepared for the competition by having scrimmages on Saturdays with Island Pacific Academy, Mid-Pacific Institute, and Kaahumanu Elementary School. Out of 38 entrants, the team finished in 8th place with their alliance partners, Kalani High School and Christian Academy. 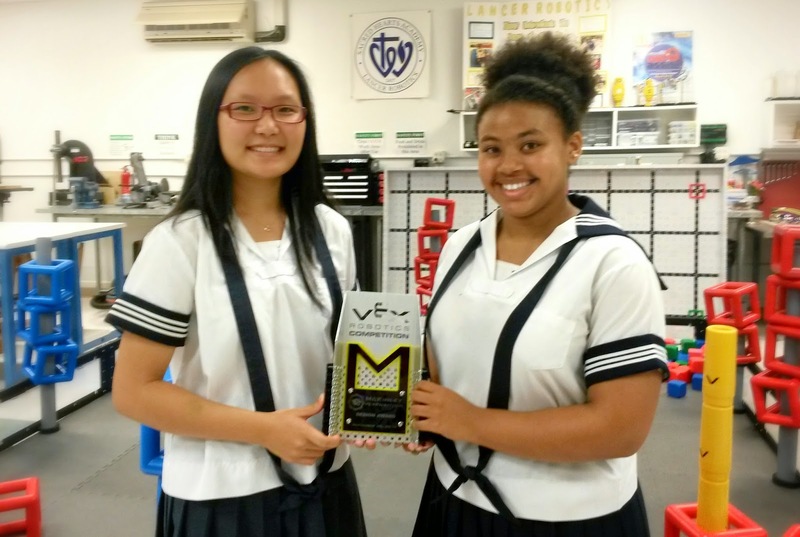 The programmers, Malia Libby and Aimee Pak, also gave the Autonomous Challenge a shot and achieved second placed among 11 entrants. They wrote the autonomous codes in ROBOTC. The objective was to stack as many Skyrise Sections as possible within 60 seconds and they scored 11 points. The robot that was used in the Autonomous Challenge was nicknamed "High Maintenance" by the driver, Jenna Tanna. It had scissor lift design which was practical but complicated to design and maintain. It went through many iterations since May and a detailed record of its design and building process was kept in an engineering notebook. Aimee Pak and Michaela Graves presented for the prestigious Design Award. This award qualifies the team to enter HECO Hawaii State Championship, on the island of Maui, on January 9-10, 2015. There was a happy accident where Aimee and Michaela went to the presentation without the robot. The judges were very impressed with their convincing presentation skills and they were sold on the design without even seeing the physical robot! Aimee and Michaela brought home the Design Award, getting their team in to the HECO Hawaii State Championship. Our second team competed with a brand new, reverse 4-bar design, bot. For the robot's drivers, Ashley Lardizabal and Adrianne Del Rosario, this was their first experience driving it because the robot was just completed the day before the competition! They managed scoring enough to rank 23rd. Winning the Design Award gave the team a lot of confidence in moving forward aggressively with expanded VEX programs in Junior High School and VEX IQ teams in Grade 6. 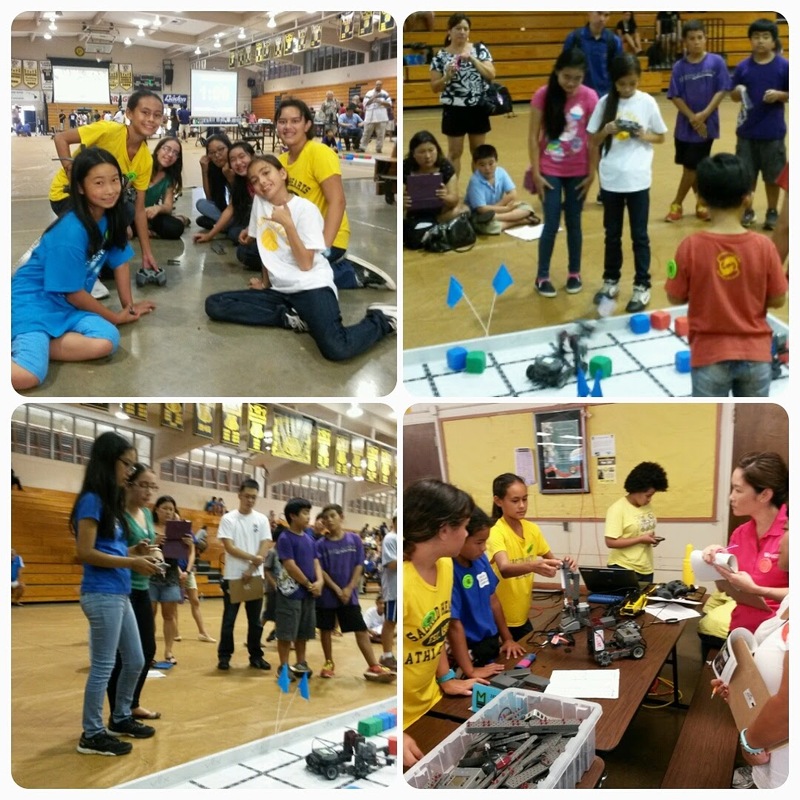 Robotics Teacher, Mr. Peter Park, and Sacred Hearts Academy is planning to host annual East-Oahu VEX and VEX IQ competitions beginning next school year at the Academy. Mr. Park is confident that within the next couple of years, Lancer Robotics will become a VEX robotics powerhouse! You can keep up to date with all of the robotics activities by liking their Facebook Page or following the team on Instagram (@Team2437).